SOMETHING STIRS IN THE DEEP… JOIN THE HUNT WHILE YOU CAN! The Hungering Deep is here, the first of Sea of Thieves' free content updates! A range of permanent new game features are rising from the depths, introduced by a special time-limited campaign. From May 29th, follow the trail of riddles and rumours to piece together what happened to 'Merry' Merrick, the proud owner of a pair of matching peg legs. Along the way, discover new features like the drum, ship's flags, speaking trumpet (for shouting at other pirates) and selectable tattoos and scars (for looking good while shouting at other pirates)! Rumours of something old, vast and hungry are surfacing throughout the Sea of Thieves. Keep your ears to the ground in the taverns, as a group of adventure-seekers calling themselves the Bilge Rats have already heard a few juicy morsels about something stirring below the waves. Dare you seek out the truth? The Sea of Thieves changes as often as the tides, so don't miss out! Join this time-limited adventure that leads from the outpost taverns to lonely, forgotten isles, piecing together the tale of Merrick the bard and his brush with hungering horror. Those who can find him and untangle his groggy recollection of events can join the hunt for his nemesis – and reap the rewards! The Hungering Deep adds these permanent new features to the ongoing Sea of Thieves experience. New Threat! Such a monstrous peril won't be easily vanquished. The risk of encountering it out at sea will live on. Drums! On the Sea of Thieves, it pays to bang your own drum. Pirate percussionists can let loose with this new instrument and play shanties with a bit more impact. Speaking Trumpets! All that drumming drowning out your orders? 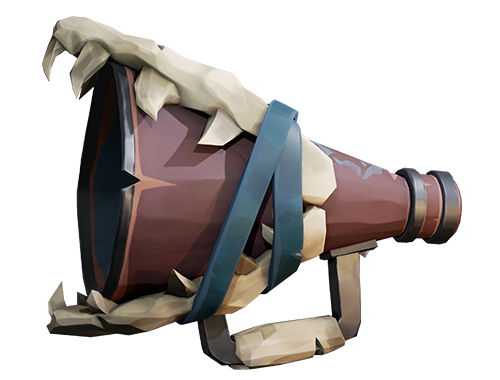 Use the new speaking trumpet to be heard at a distance and find other crews on the same voyage. Tattoos and Scars! The Hungering Deep expands the vanity chest: choose your tattoos and scars to tell your own pirate story. The Sea of Thieves ebbs and flows constantly, bringing new events, new adventures and new rewards! Want to stay on the crest of the wave? Share a grog with the Bilge Rats, rumour-sniffers and thrill-seekers extraordinaire. The first step is easy – take part in the challenges of The Hungering Deep and don't end up with two shoes too many, like poor old Merrick.